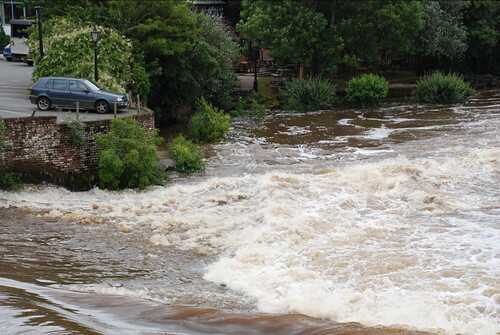 Michael Jecks: Photo Diary » Blog Archive » The Same Weir near the Mill Bridge, Exeter. The Same Weir near the Mill Bridge, Exeter. DSC_0011.JPG, originally uploaded by michael_jecks. Yes. Compare this with the photo below. Incredible difference in the sheer quantity of water flowing over the weir. There wouldn’t be a chance of standing in that torrent. All of the island where the two were standing in April is overwhelmed, and the majority of the bank has disappeared too. A shocking difference. See the tables in the beer garden on the left bank? The picture’s not taken from exactly the same spot, but it show the difference. In one part of the country it was said today that they had had a month’s worth of rain in three hours. It’s fortunate that only three or four have apparently died. We can only hope no more do. « The Weir near the Mill Bridge, Exeter. This entry was posted on Tuesday, June 26th, 2007 at 8:10 pm	and is filed under Dartmoor. You can follow any responses to this entry through the RSS 2.0 feed. You can skip to the end and leave a response. Pinging is currently not allowed.